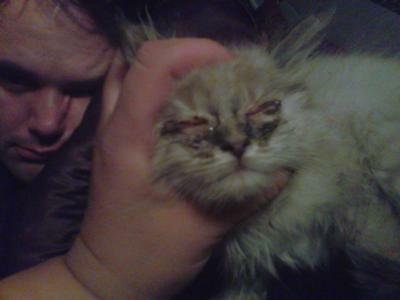 I found a kitten with her eyes sealed shut with a green substance. I took her home, washed her eyes and fell in love. That was about three weeks ago. Since then, i have consistently cleaned her eyes and it keeps coming back. I am not sure what to. Your kitten is lucky to have found you! Since her eyes have not cleared up with the care you have been providing at home, it’s time to get her in to see your veterinarian. Kitten strays, especially, are at risk for a number of viral and/or bacterial infections that can cause the symptoms you describe. Other problems could be to blame too, so it’s important that your kitten’s condition is properly diagnosed so that appropriate treatment can be started before permanent damage to her eyes occurs. Your veterinarian can also talk to you about vaccinations and other preventative care that your kitten should get to keep her happy and healthy. Join in and write your own page! It's easy to do. How? Simply click here to return to Cat Eye Infection.